In 12-inch skillet, heat water to boiling. Add asparagus. Heat to boiling; reduce heat to medium. Cover and cook 4 to 6 minutes or until crisp-tender. Drain; set aside. In same skillet, melt margarine over medium-high heat. Stir in mushrooms. Cook 2 to 3 minutes, stirring frequently, until mushrooms are light brown. 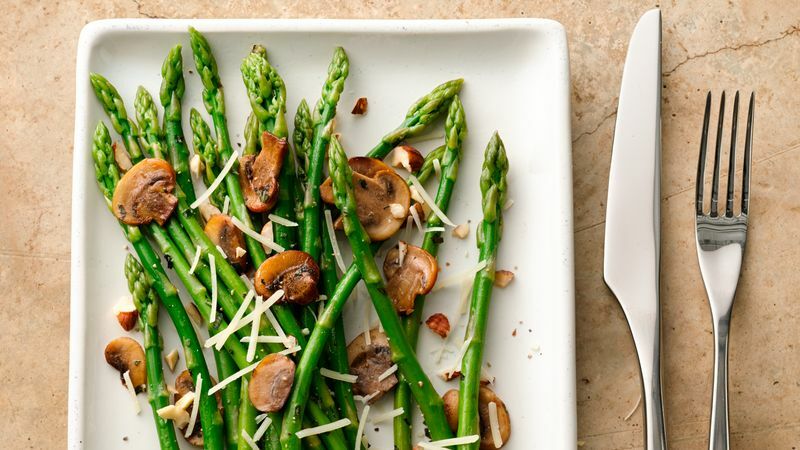 Stir asparagus, basil, salt and pepper into mushrooms until vegetables are coated with seasonings and asparagus is heated through. Sprinkle with cheese and hazelnuts. Toast the hazelnuts for additional flavour. Before using the skillet for asparagus, cook hazelnuts in skillet over medium-low heat 5 to 7 minutes, stirring frequently until browning begins, then stirring constantly until golden brown.